“We wanted to let folks know that, hey, this is a NORAD video, and we’re the military and this is our mission,” Navy Captain Jeff Davis said. Allen Kanner, a California child and family psychologist and co-founder of the Boston-based Campaign for a Commercial Free Childhood, told The Boston Globe the Pentagon is “completely out of line” for linking Christmas with the military. Another video on the NORAD Tracks Santa website shows military personnel preparing for a test flight with an intelligence officer asserting that “intel can confirm that Jack Frost and the Abominable Snowman will not be a threat,” The Globe reported. 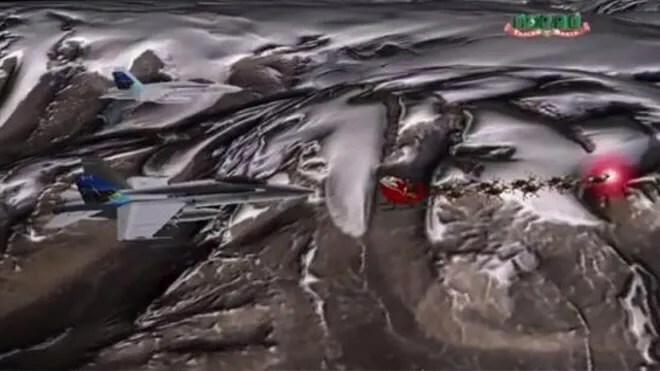 Davis told Reuters that NORAD videos have linked fighter escorts and Santa since the 1960s, but 2013 marked the first time the jets had appeared in an animated version. “It’s still cutesy since it’s for kids, but we don’t want people to lose sight of our true mission,” Davis told The Boston Globe. NORAD Tracks Santa began nearly 60 years ago when a newspaper listed the wrong number for children to call Santa and they ended up calling NORAD’s predecessor, the Continental Air Defense Command. The program drew 22.3 million unique website visitors last year and generated 114,000 phone calls fielded by 1,200 volunteers, Davis told The Globe. This website will be available in eight languages this year. This is crazy. I hate to be reactionary, but Santa should in no way be connected with the military. It’s obscene. You know, the whole NORAD tracking Santa thing goes way back and used to be cool, but having Santa escorted by military jets does put a sort of weird non-childlike magic to it. Strange how a missile tracking website made a cool Christmas tradition to start with, now I think times have passed it by. The sad part is I think they were really still trying to be fun and don’t realize military jets ruin it. Well I guess it fits in with our society now… maybe the jets are protecting Santa from terrorism. ..
“Santa” (the commercialization of the holy season of Advent, the birth of Christ) mocks the true reason for the season, but we continue to put it out for the sake of the kids. No harm done, for the most part. I think the reaction to this is excessive. Don’t let the kids watch it if the idea is offensive to you. Take personal responsibility here. I am a Christian but don’t believe in religious holidays. I personally believe we are to treat every day as a chance to do what is right. Santa Claus is fun for kids so we always did up Christmas for the children. The NORAD thing I think is just outdated now that the Cold War is over. But you are right, most people showing offense had no idea the site even existed.